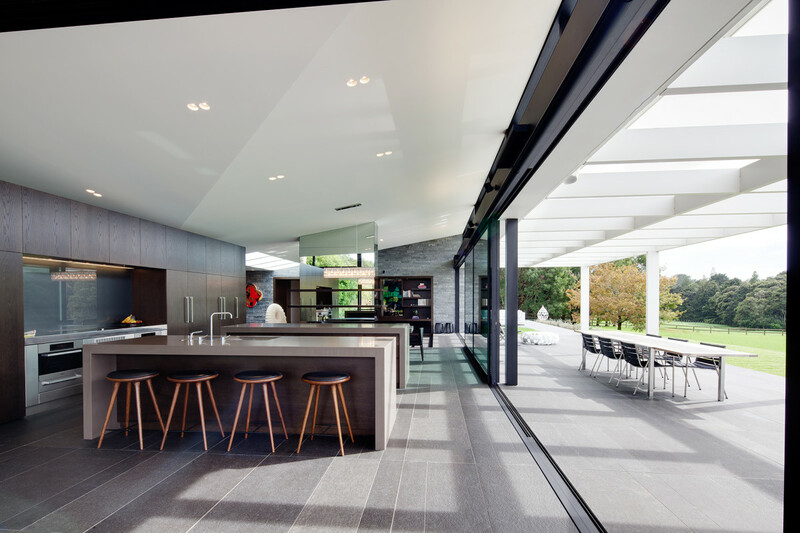 Working with Ponting Fitzgerald, this large scale project incorporated all of the main living spaces; kitchen, bathrooms and ensuite, bedrooms, living, wine cellar. 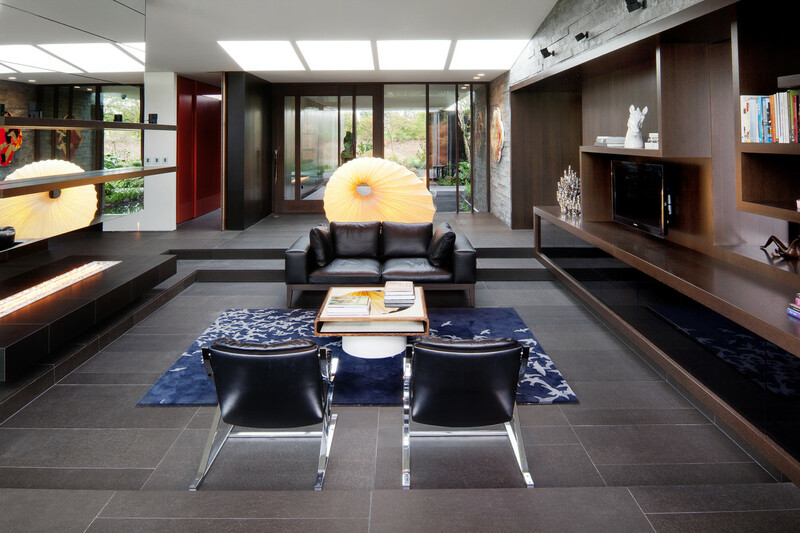 The exceptional architecture and extravagant interior finishes required a suitably high level approach for all of the interior furnishings and cabinetry. The extensive elements that Form Design custom built and installed gives a sense of completion and style that complements the architecture throughout the entire residence. The impressive kitchen comprises three islands, with the largest a freestanding set of cabinets and drawers which houses the cooktop and a custom made grill, which manages the heat generated from the induction cookers. While the cabinets are dark stained American white oak, the bench tops are a composition of engineered stone to give a flawless, seamless finish. Dividing the kitchen and the main living space is a fireplace. Above the fireplace the flue is wrapped in mirrors providing a 360 degree reflection of the luxurious environment, and includes floating oak shelving. 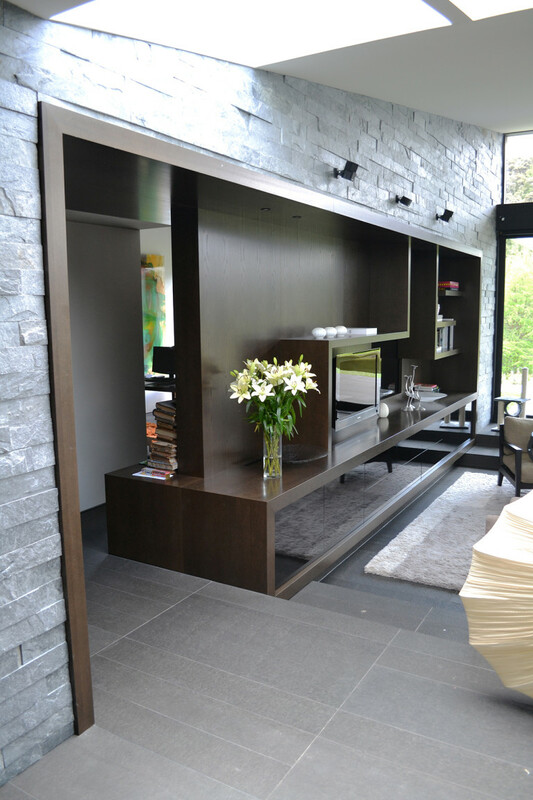 Directly opposite is a floating shelving unit that extends round to create walls of the adjoining space. Working with the uneven surface of basalt tiles required absolute precision to ensure a perfect fit. The bathrooms and bedrooms had the same challenge as elements made for the rest of the house – to custom build large scale units to fit within a millimeters tolerance. Where necessary, custom steel brackets were manufactured to fit in the wall cavities so that they are invisible and concealed. 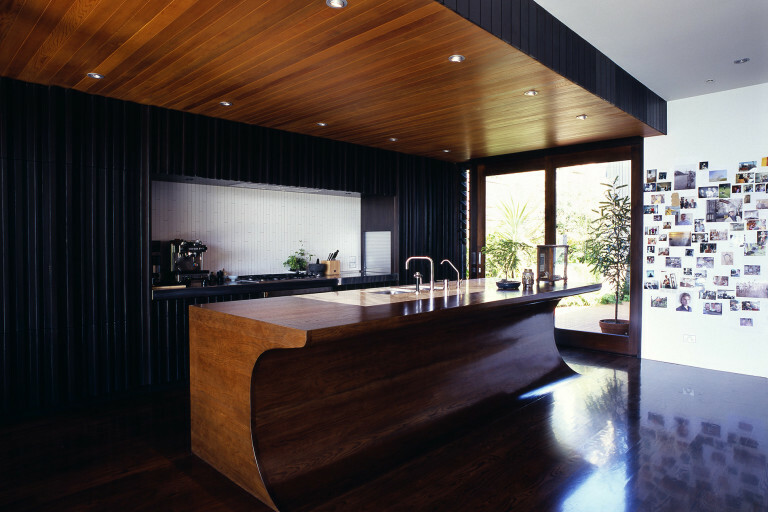 To successfully deliver this level of craftsmanship Form Design worked collaboratively with the architects and builders. Careful and considered planning with clear and concise communication was key to its success, which is a typical approach for Form Design.